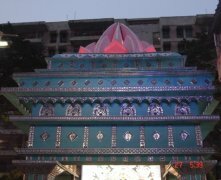 The Baha’i House of Worship of the Indian sub-continent, also known as the Lotus Temple, is being replicated as part of a pandal for the 65th Singhi Park Durga Puja festival in Culcutta. Durga Puja is the biggest annual festival for Benagli Hindus. The Indian Baha’i House of Worship, which is open to people of all religious backgrounds, is shaped in the form of a lotus, the national flower of India, it was chosen for this pandal because of the patriotic feelings associated with the flower. Express India – Here’s Delhi’s Lotus Temple for you at Singhi Park! This article, published on October 20th in The Times of India, gives voice to the uniting vision of the Baha’i community and provides a glimpse of how an optimistic view of the world’s future may take evidence from the turbulence of the times in which we live.